Do you have any questions for Crossfire hosts S.E. Cupp and Van Jones about climate change? 2014 midterms? Have you been eager for the opportunity to debate with them? 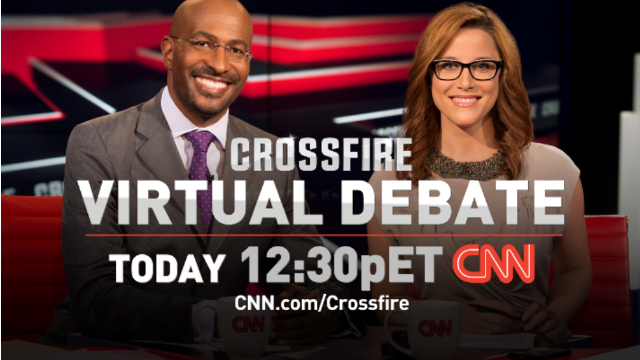 You'll have your chance to jump in the Crossfire debate with Cupp and Jones Today at 12:30pm ET in a live town-hall style video chat. Submit your questions about today’s political stories and issues in advance by tweeting them using #crossfire or leaving them in the comments below. You’ll also be able to ask questions during the event. Web cams are encouraged so you can ask your questions live via video, but not required. Make sure to RSVP here so we can remind you before it starts. Looking forward to seeing you all there! Really need to compare the global warming debate with the previous lead debate. Scientists raised the alarm on lead poisoning on a global scale even as junk science was funded by energy companies. Now it's the same thing with carbon gasses leading to a catastrophic failure in climate. Please all talk at once, so we can better understand your positions...sic...cacophany comes to mind. Hello Van and S.E. Great show that the four of you put on. I am glad that it is back on the air. I have a few questions for you both. The topic that I think is most important to address is the minimum wage debate. Why is everyone so obsessed with the living wage angle? An increase in wages becomes an additional liability or expense to any employer. To account for that increase, something has to give. No business is going to allow for its bottom-line to suffer. Assuming employment remains constant, because employers need people to fill those jobs (unless computers pick up the slack), the only possible area for that increase to be addressed is prices. If a minimum wage increase were to go up to $15/hour, then prices would have to increase. What are your opinions on inflation of this manner? What other options could be explored account for the increase in wages? Is there a better solution to living standard problems than just increases in money? If money is the only solution Congress wants to debate, what would they say about purchasing power increases as opposed to dollar amount increases? What other thoughts do you have on the subject? Thanks again for hosting this great show. Van, I want to see more compromise out of you. I know it is in there somewhere. Why is the republican party so anti-background check before the purchase of a gun, but they support laws that require a photo ID to vote? Many states already require a perspective voter to prove their citizenship when applying to vote, so these Voter ID Laws seem redundant. The GOP argument is always it’s their constitutional right to own a gun but so is voting. Last time I checked there’s been less than 200 cases of voter fraud in the US but thousands of gun related deaths and it’s not just people with illegal guns that are killing human beings. In addition, couldn’t someone with a criminal record very easily purchase a gun legally if they live in a state that doesn’t require background checks? I’m sorry to say but the argument on the right regarding photo ID’s to vote elicits a stigma of racial bigotry being this was not an issue before a black man was elected President, not once but twice! I hope Soylent Green doesn't become a reality. Charleton Heston would be proud if not for Alzheimer disease. In the past I've voted for the person, regardless of party. I'm reconsidering that stance. I would like to know on what logical grounds the Speaker of the House is holding up approval of the unemployment extension bill already passed by the Senate? The speaker apparently insists that an unemployment benefit extension be tied to a job creation bill or it's a no go. His intransigence on this issue is impacting millions of Americans. Some members of his party in the House have suggested either the long term unemployed are lazy or have become victims of a government handout mentality. Isn't this insulting to millions who have been laid off as well as those who are no longer counted in the unemployment figures? Tis extension is funded and extends benefits only through May It won't break the bank but It will help people meet their bills and it's generally agreed it will aid the economy. Where is the moral argument to block this? I'm still waiting to hear it!